What language was spoken in Hong Kong originally? At first, the people lived in Hong Kong can be traced back to Song Dynasty and Yuan Dynasty and they were formed by five big families. The five big families were Tang, Pang, Hau, Man and Liu. At that time, the language they spoke was called Wei Tau Language (圍頭話), or "local language", which is a branch of the Cantonese. 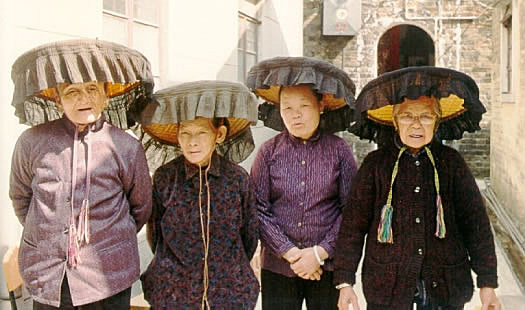 The five families were the first group of people who lived in Hong Kong when comparing with Hakka people, and that was also the reason the five families called themselves as indigenous residents. On the other hand, Hakka in Chinese has the meaning of "visitors", which suits them as they arrived Hong Kong much later than the five families. In Qing Dynasty, Koxinga (鄭成功) used Taiwan as the base to resist the Qing government. At that time, in order to prevent Koxinga from getting support from Guangdong and Fukien provinces; the Qing government implemented the Great Clearance in 1661, which required the local residents who lived near the coastline to move their homes 30 kilometers backwards. The clearance made the fertile soil left abandoned, and thus directly affected the tax revenue collected. Seeing the policy went wrong, the Qing government abolished the policy in 1669, re-allowing the residents to move back to where they belonged. However, even the Qing government lifted the restriction, only about 4000 people (25% of the population) were willing to move back; thus it was almost impossible to regain the production level it used to be. In order to restore the production level and the tax revenue, the Qing government used cash subsidy to attract people from other places. At that time, Ka Ying State, the North East area of Guangdong province with Hakka as main language, was suffering from overpopulation; they then moved to the estuary of Pearl River, including Hong Kong. In 1700, they built more than 400 Hakka villages in Hong Kong and hence brought the use of Hakka too. Though the population of Hakka in Hong Kong was far less then local residents, they live in way more places than local people. At the time of 1911, the usage of Hakka composed about 15% of the total population in Hong Kong. As stated by Lau Chun Fat (2004) and Guangxi University Press (2003), Hong Kong is an "immigrant city". During the period of 1911 and 1996, the population surged from 450000 to over 6000000. For example, in 1920, many Chiuchow labor moved to Hong Kong due to government's invitation of city development; in 1950, after the war of anti-Japanese and Chinese civil war, many more people from different provinces moved to Hong Kong. As a result, many languages and dialects were brought, like Guangzhou, Chiuchow, Shanghai, Siyi, Hokkien and Hakka. Hakka thus only constituted only about 8% of the language spoken in Hong Kong. When it was 1974, the Hong Kong government announced Cantonese as one of the official languages. Cantonese then became the dominant language in education, media and public places. People gradually decreased the usage of their own languages. To Hakka people, even though they value their own language very much, they could not neglect the fact that their next generation stopped using Hakka. In 1990, most Hakka parents used Cantonese to talk to their children. Also, thought Hakka has different accents, Hakka people with different accents basically were able to understand one another; even when it came to unintelligible situations they could always switch to Cantonese as most of them could speak Cantonese fluently. As this goes on, the extinction of Hakka in Hong Kong is doomed to happen. 1) The parents themselves could not master Hakka fully as well, because they can not express themselves fully in Hakka, they thus can not teach their children. 2) Spouses are not Hakka people, they do not know Hakka, thus making using Hakka in family impossible. 3) They consider Hakka as redundant, useless in modern society. Thus, it is clear that users' attitude towards the language is also crucial in the preservation of it. How important is it? It will be explained in the next session: Attitudes towards Hakka.